Vagabond English: Transform your English Book by Book. Sign up here to get started with your creative journaling challenge. The program contains 4 emails delivered over one week. Once you're finished, you'll have the option of staying on to receive the Vagabond English Newsletter and updates for upcoming programs and events. If you'd like to receive the Newsletter please be sure to tick the box below. 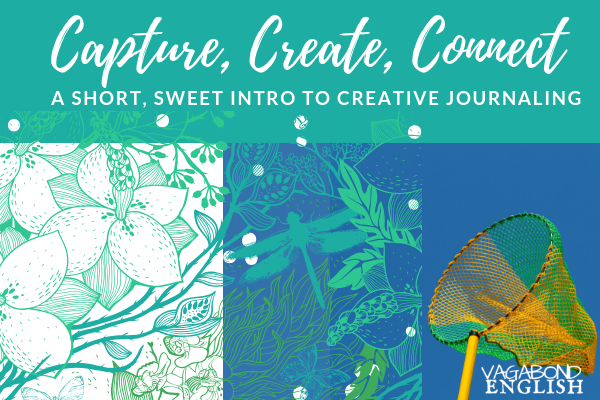 Vagabond English will use the information you provide on this form to send you the Capture, Create, Connect creative journaling course. If you wish to continue with the newsletter and to provide updates on discussions, writing challenges, upcoming programs and marketing. Please be sure to check the box below. You can change your mind at any time by clicking the unsubscribe link in the footer of any email you receive from me, or by contacting me at trisha@vagabondenglish.com. I will treat your information with respect. For more information about privacy practices visit our website https://www.vagabondenglish.com/privacy-policy/. By clicking below, you agree that I may process your information in accordance with these terms.